COLOMBO – Pakistan could score only 247 runs in the first inning of the three-day practice match against Sri Lanka President’s XI at Colts Cricket Club Ground, Colombo on Thursday, 92 News reported. After winning the toss, Ahmed Shahzad smashed 82 runs, thanks to one six and 10 fours. Younis Khan scored 64 runs, while Muhammad Hafeez (3), Azhar Ali (12), Misbahul Haq (15), Asad Shafiq (27), Sarfraz Ahmed (12), Wahab Riaz (13) and Yasir Shah (9) were the other scorers. JDF Vandersay chipped in with five wickets, while TAM Siriwardana took two wickets. MVT Fernando, NT Gamage and CAK Rajitha got one wicket each. 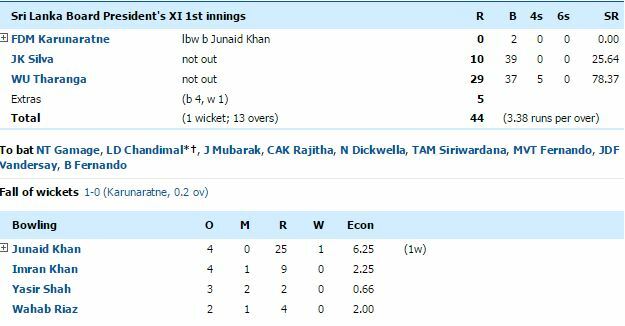 In reply, Sri Lanka President’s XI scored 44 runs for one wicket.